Shayna + Joshua's Historic Rice Mill Wedding was certainly a night to remember! 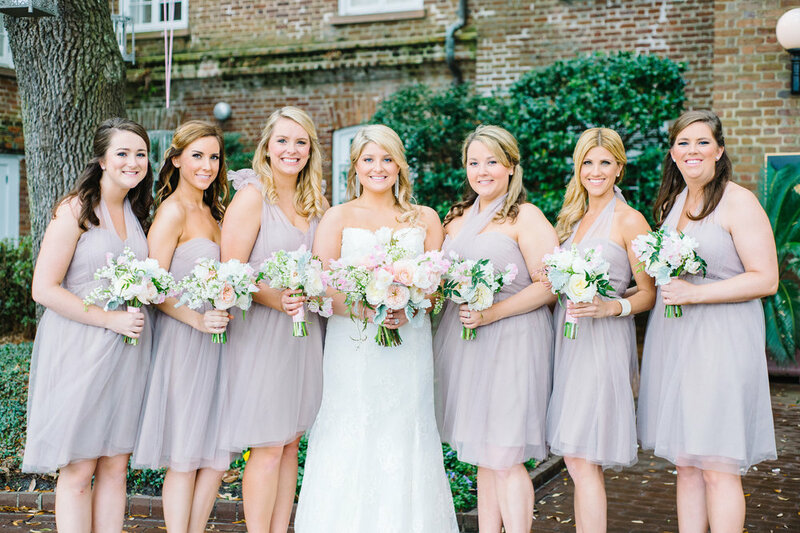 This sweet couple traveled from Washington, D.C. to downtown Charleston to say "I do" at the Historic Rice Mill in front of their close friends and family. The day began with hair and makeup by Beauty Asylum for Shayna and her bridesmaids, while Joshua and his buds suited up pre-nuptials. Everyone then met at the Historic Rice Mill, but Shayna was kept hidden from her soon-t0-be husband until the ceremony began. The ceremony took place outside with the Historic Rice Mill as the backdrop. Joshua's mouth dropped wide open when he saw his beautiful bride walk down the aisle. 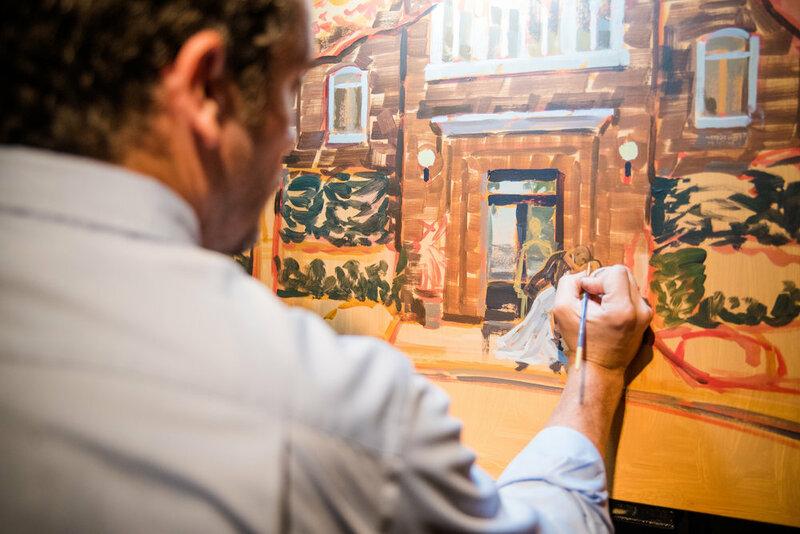 Joshua's father officiated the ceremony and it ended with a dip and a kiss by Joshua that was later painted by Wed on Canvas for the newlyweds to hang and cherish forever! Post ceremony, it was time for cocktails and hors d'oeuvres inside. The color scheme was ivory and navy with sparkly silver accents and special touches by the bride + groom that incorporated their love of wine, such as table markers and different bottles of wine for each table! The table scape was complete with silver chivari chairs and a traditional Southern grits favor for each guest to take home. Their lounge was set up outside on the dock with white leather couches, elegant crystal chandeliers, tall cocktail tables with sequined linens, and silver accent pillows to finish off the look. Guests loved the decor, and the cuisine as well! During the plated dinner, Shayna's father gave a heartfelt speech, thanking friends and family for traveling to Charleston, and sharing stories about the bride + groom's whirlwind romance! After dinner, it was time to cut the cake and dance. Stephen Darby kept the guests on their feet all night and played some crowd favorites, such as Beyonce's "Drunk in Love," while guests enjoyed light-up accessories to use on the dance floor! As this memorable night came to a close, Shayna + Joshua were sent on their way through a sparkler archway into a white Rolls Royce onto their after-party at Trio Downtown. Wishing these newlyweds love and happiness for many years to come! We absolutely adored this romantic glam brunch wedding for Lacey + Joey, a couple from Florida who chose the Historic Rice Mill to serve as the perfect backdrop for their wedding on the water! The day began with hair and makeup by Paper Dolls (and plenty of Starbucks) for the bridal party at the Charleston Place suite. The bridal party + groomsmen then made their way over to the Rice Mill for an outdoor ceremony under a clear tent on the back patio. Who says rain is bad luck on your wedding day?! Pure Luxe Bride rocked the rain plan with swagged light pink drape from the top of the tent and ivory drape at the altar, held back by lush floral tie backs full of white hydrangeas and blush garden roses, creating an intimate ceremony space. Rows of gold chivari chairs lined the aisle that was covered with pink, blush, and white rose petals. Joey's smile was contagious as Lacey gracefully walked down the aisle beside her father. After the ceremony, guests made their way inside for the start of the reception! The room was filled with shades of taupe, peach, blush, ivory, and champagne, as two long tables ran down the center of the space. Clear candle votives were scattered along the length of the table with tall crystal candelabras topped with a spilling arrangement of white hydrangeas, blush sweet peas, blush ranunculus, white amaryllis, and more. Another gorgeous floral arrangement was an elegant hanging garland over the bride + groom's cake, brimming with white majolica spray roses, blush garden roses, white lilac, and more! Branch did an absolutely beautiful job with these flowers. Textured linens and taupe loveseats completed the lounge's chic look. Guests enjoyed a delicious brunch, complete with a juice and coffee bar, by Good Food Catering. Chucktown Sound kept the guests on their feet as they danced the day away before it was time to send off the happy couple through a cloud of bubbles! Thanks so much to Aaron and Jillian for capturing this gorgeous Historic Rice Mill Wedding!